Pavilion in the Park is a unique venue in the heart of Midtown Little Rock. The bright, airy, glass-ceiling atrium features a fountain, lampposts, benches, and potted trees. 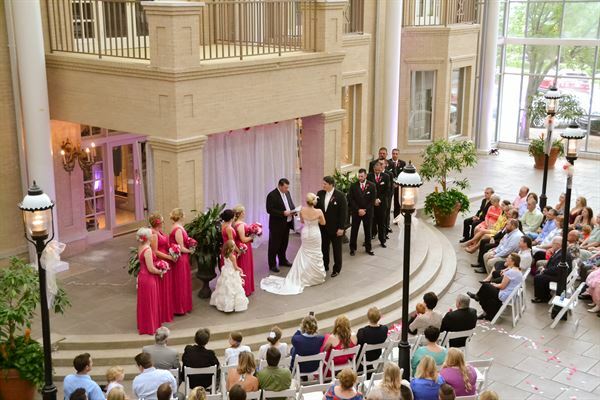 Ideal for combination wedding ceremonies and receptions. The Pavilion Room is Trio’s private event venue. Our large, open room has one mirrored wall and a neutral palate of warm colors accenting the walls and furnishings. The carpeted room features a built-in bar / beverage area and two private restrooms. Artisan ironwork gives the room unique appeal. The Pavilion Room is Trio’s private event venue. Our large, open room has one mirrored wall and a neutral palate of warm colors accenting the walls and furnishings. The carpeted room features a built-in bar / beverage area and two private restrooms. Artisan ironwork gives the room unique appeal. Trio’s Pavilion Room accommodates a maximum of 80 people (a very cozy 80) for a seated function. It can accommodate up to 100 for a cocktail party. 25 people or less: $50 26 to 50 people: $100 51 people or more : $125 Party Room How to Book a Date and What if I Cancel? : There is a $100 deposit to reserve the Pavilion Room which will be applied to the final bill. Because of high demand, this deposit is non-refundable in the months of December, May, and June. To cancel a date for all other months, we require two weeks notice.